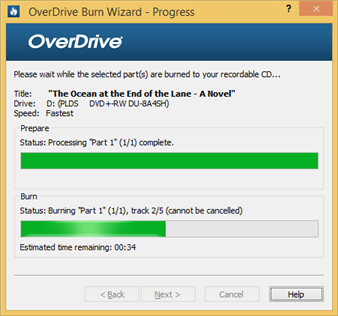 You can burn audiobooks to CDs using OverDrive for Windows (desktop). Note: Due to agreements with publishers and digital media suppliers, audiobooks from OverDrive cannot be burned to DVD or Blu-ray. Open OverDrive for Windows (desktop). Select an audiobook, then click the Burn button. Insert a blank CD into the CD drive on your computer. Click Next. When the burn wizard finds your drive, the "Confirm" screen is displayed. Select the part(s) to burn. You will need one CD for each part. Click Next. The selected parts will burn to the CD. When the burn is complete, click Finish to close the burn wizard. Our app burns borrowed audiobooks as "audio CDs." If you manually burn audiobook parts to a CD in a data format (outside of the OverDrive app), then you'll only be able to listen to the audiobook on a computer or CD player that supports MP3 discs. If you're having trouble listening to a CD you burned, check to make sure that your CD player plays CD-R discs. If you used a CD-RW disc, try burning the title again using a CD-R. Some CD players have trouble reading CD-RWs.